Is this soda ash? The photo above is a fresh cut bar with the stuff in question laying on top. I've only been making soap for a short while, about 10-12 batches and I'm not sure if this is soda ash. The recipe was: 15.4 oz pure olive oil, 6.55 oz coconut oil, 7.24 oz distilled water, 3.23 oz lye and 1 oz of fragrant oil. Oil and lye water were combined at approximately 120 F. The loaf reached full gel 30 minuets after going in the mold, max temp was 150 F.
Soda ash is a powdery white residue that can form on the surface of the soap. From what I can tell from your picture, that certainly could be what your soap has. It is nothing to worry about other than from an aesthetic standpoint. You can do a couple of things to help prevent it from happening in the future. Next time when you pour the soap into the mould, spray the soap with a small bit of rubbing alcohol. This seems to help prevent soda ash formation. Using distilled water, discounting the water in your recipe and allowing the soap to cool slowly may also help reduce the amount of ash. For the soap you have already made, you can use steam and gentle rubbing to remove the ash deposit. I've also run your recipe through SoapCalc. You are using a very low super-fat margin of only 2%. For soap that is to be used on the face and body, I do suggest increasing that amount to a minimum of 5%. For soap that is to be used for cleaning clothes and dishes, 2% is just fine. 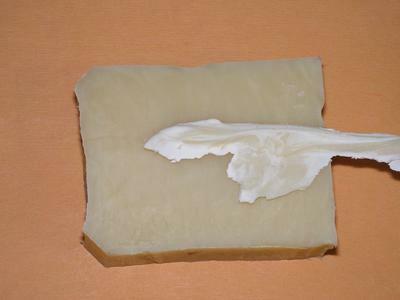 When making small batches of soap, a small super-fat margin does not leave enough room for small measuring errors and can easily lead to lye heavy soap. Comments for Is this Soda Ash? Looking at your soap and not just the sliver on top I think your soap may have overheated slightly causing some of the coconut oil to separate and rise to the top where it saponified creating the layer of whiter soap. I would recommend soaping at a lower temp. Thanks for the information Cathy! The white sample is not powdery, it's more like a very thin layer of white soap. I'll try the alcohol tip and see what happens. I was not aware that face and body soap should have a higher super-fat percent, guess that explains the dry skin! Next batch will have a higher percentage.